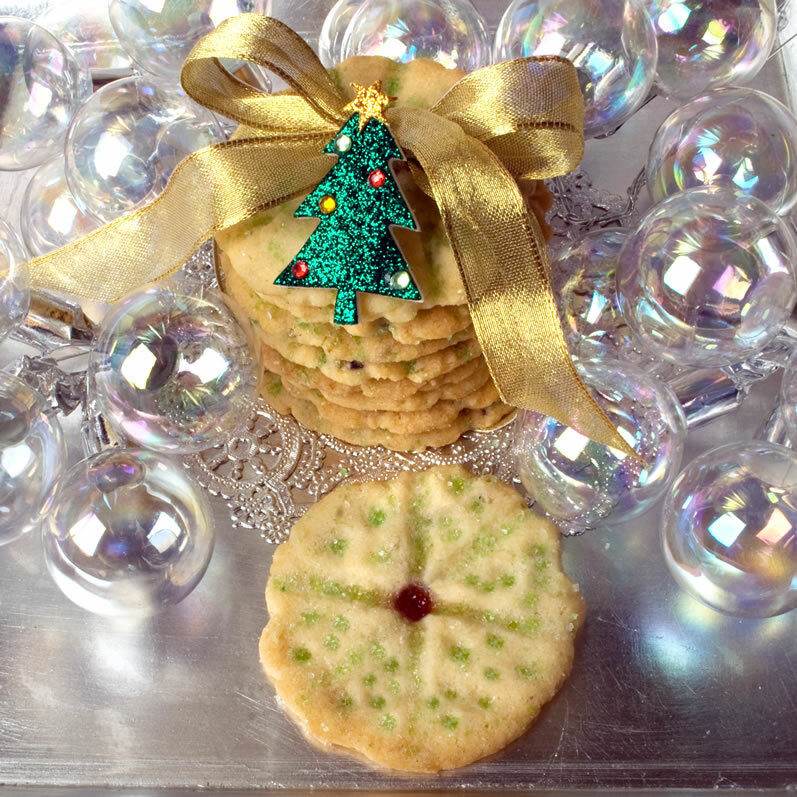 On the eighth day of Christmas … my true love gave to me … Heavenly Brown Butter, Lavender & Lime Cookies. If you have been reading this blog over the 15 months of its existence, you probably know by now that I am very fond of two flavors to an inordinate degree: lavender and lime. You may even remember the Blueberry Lavender Limeade I created this past summer. That inspired flavor combination still lingers in my mind. Now add to that the fact that every dessert cookbook I pick up seems to contain a lyrical, almost devotional testimonial to the magical properties of brown butter. Is it a sign? Is the Spirit of Christmas speaking to me? I decided to find out by combining heavenly brown butter with, yes, you guessed it, lavender and lime. The result is, simply, quite out of this world. As it turns out, the unsalted butter I use (Trader Joe’s) contains about 20% water. The typical amount of water in butter is often said to be 15%. When you make brown butter, you evaporate most of that water from the butter. Thus, brown butter is nearly all fat with hardly any liquid. It is the liquid in the butter that binds with the gluten in the flour to create a structure that holds together after baking. If you use the same proportion of brown butter as regular butter in cookies that contain no other liquid, the resulting cookie will be so “short” and crumbly that you will barely be able to pick it up without it falling apart in your hands. The taste will be wonderful, but you will be eating a handful of crumbs rather than a cookie. I learned this lesson the hard way this holiday baking season. After some experimentation, I determined that each stick (8 tablespoons) of Trader Joe’s unsalted butter loses about 1½ tablespoon of liquid during the conversion to brown butter. Thus, for cookies that contain no other liquid, you must resupply that 1½ tablespoon of liquid to every 6½ tablespoons of brown butter. The liquid can be anything that does not contain additional fat, such as water, cider, citrus juice, fruit juice, and so on. To determine how much liquid is held in suspension in your particular brand of butter, simply make brown butter as described below, pour it into a 2-cup glass measuring cup, and determine the difference between the new liquid measure and the original 2 cups of melted butter. That difference must be resupplied with liquid, if no other liquid is called for in your cookie recipe. These delicate, crisp, crunchy, super buttery cookies are as good as cookies get in my humble opinion. The lime flavor is pronounced and underscored with the soft note of lavender. Cookies for the angels! In a stand mixer fitted with the paddle attachment, cream together the chilled brown butter and sugar. Add the lavender and lime zest, and incorporate. Add the lime juice, cold water, and lime oil, and incorporate. If desired, impress each cookie with a skewer or other implement to create a design. 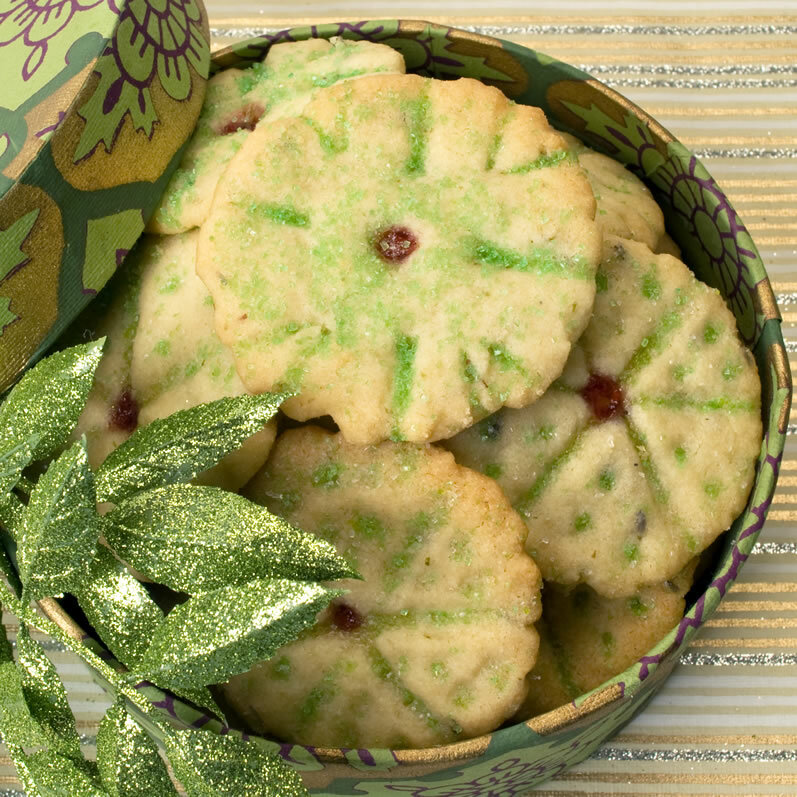 Sprinkle colored sanding sugar over each cookie to emphasize the lines of your design. 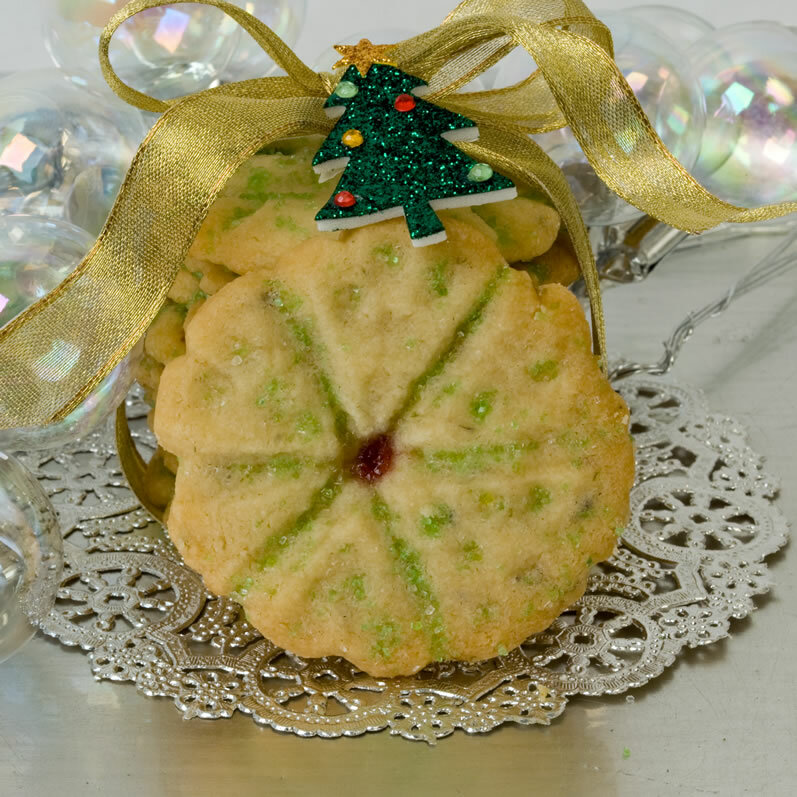 Create a small indent in the center of each cookie and pipe a small dot of jelly into the indented space. Bake each sheet of cookies at 350° for about 13-14 minutes, rotating the pan at the halfway point to ensure even browning. Store airtight, in layers separated by wax paper rounds, in a cookie tin, in a cool, dry place. These cookies improve with age. They keep for 3-4 weeks. Cookies may also be frozen. Makes about 6 dozen, 2¼-inch diameter cookies. As long as you are making brown butter, make enough to have on hand for a week or two. Continue cooking butter at a slow simmer (don’t worry about the foam), until the butter turns a light caramel color and you smell a nutty aroma. Remove from the heat immediately and pour through a triple mesh strainer into a 1-quart measuring cup. Let cool to room temperature, cover with plastic wrap, and refrigerate until hardened. To follow along as we bake our way through this year’s Twelve Days of Christmas Cookies: Starry Night collection, see the kickoff post and the entire collection. I made these almost a week ago & although I love the flavor, I screwed up and they are very tough. 3) Maybe I didn’t make them thin enough. market and am storing it in my fridge…could use some more baking recipes for it…hint, hint. Thanks for any thoughts on my wrong-going here. Kate, bummer! Yes, he dough is hard after refrigerating (as is butter) and must be allowed to come to room temperature before flattening it. I’m going to the recipe now to make this clearer. Even if you didn’t flatten the cookies enough though, they should not be tough after baking. They should be crisp and practically melt in the mouth. Not sure what happened here. Thanks for letting me know though. Wow, these look amazing! Yum. 🙂 The combo of lavender and lime sounds fantastic. .-= Sara´s last blog ..Lime-Coconut-White Chocolate Chip Muffins =-.